You will see a RSA error from the SA server when trying to use SAML assertion or message signing with the use of WindowsSSO. Verify the cause of this issue and proceed through process of elimination to deduct the culprit. First verify if this indeed only does happen with SAML assertion or message signing by turning those flags to false and see if the SAML works after. If the error still occurs, we will look at the certificates by going to the certificate console. Ensure that Authenticated Users has at least Read access to the private key. 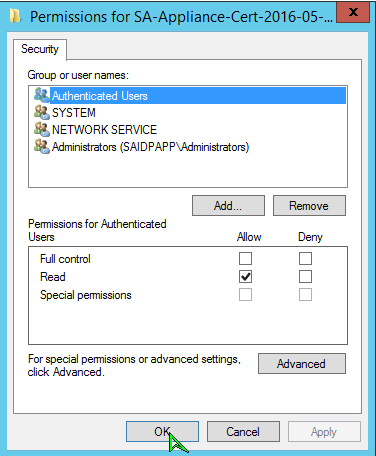 Once that is good to go, re-enable SAML assertion signing and you should be good!